The ace Dilraj Mann will be in attendance debuting a brand new screenprint (immediately below) as well as a new zine, Queue. I think he'll also have originals for sale too, which I'm going to try and get ahold of. But make this a must-stop table- Mann's immensely gifted, as is obvious even from the couple of images below. 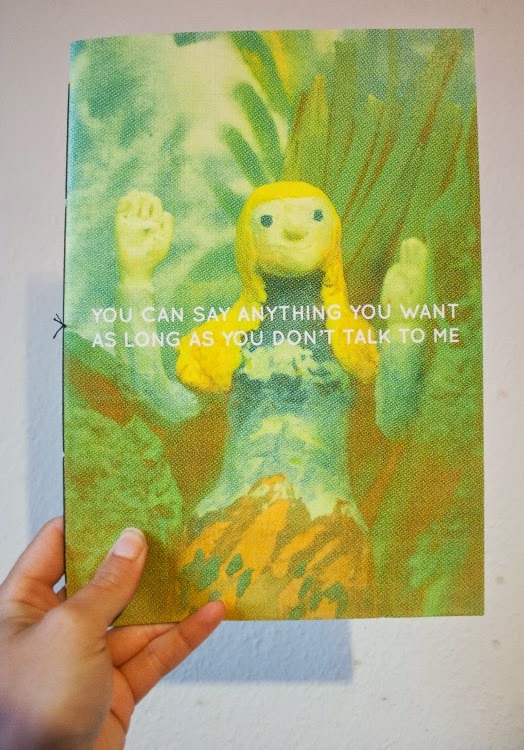 I'm going to be pretty gutted if I don't get my hands on one of these- Disa Wallander's created only 20 copies of her new comic which will be for sale at the small press table. It looks absolutely amazing- flip covers, with a split perspective story, and it includes a disc with a short accompanying animation. Honestly, I almost didn't want to tell you about it, in case they all sell out before I get there. Good karma, yes? 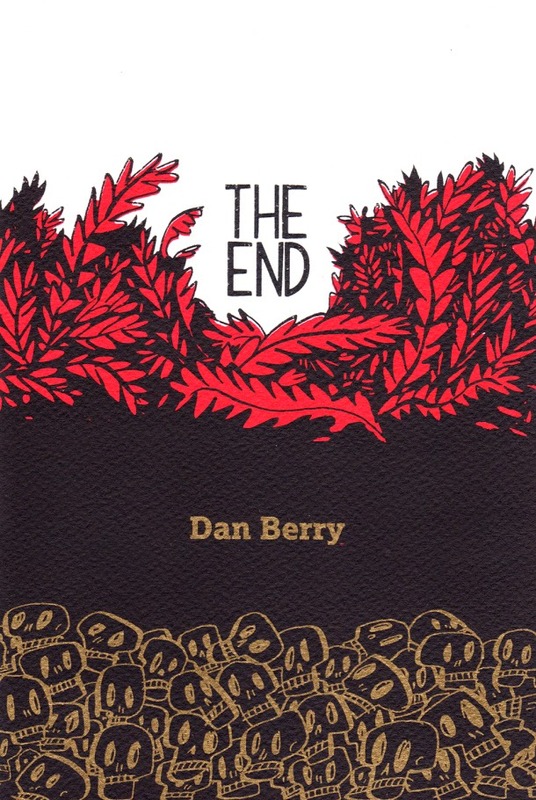 The Comics Spire has a lengthier preview of probably the hardest-working-man-in-UK-comics, Dan Berry's new comic, titled The End, in which the populace wakes up one day to find a mysterious, somewhat sinister, countdown has been started by someone- but by whom, and to what, nobody is entirely sure. 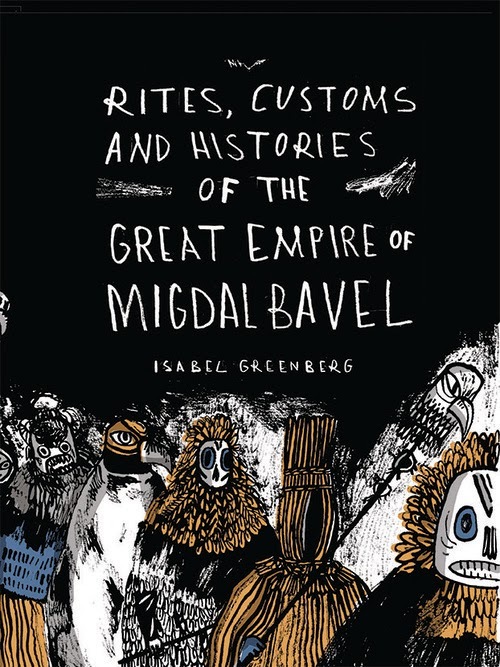 Really digging that gold skull-embossed cover. 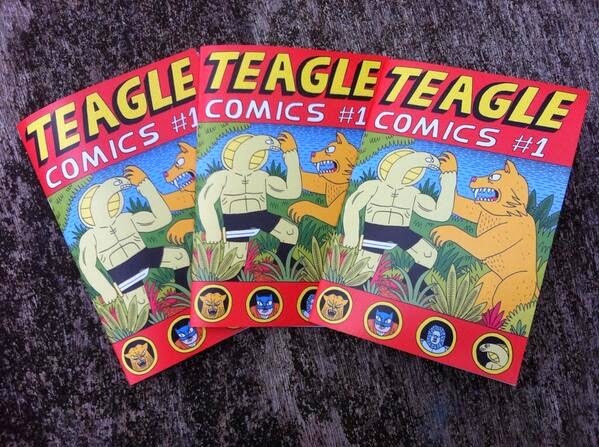 Jack Teagle will have Teagle Comics #1 and other new comics, and probably an array of prints also, I'm guessing. Antoine Cosee will be there, along with the folks of Breakdown Press. 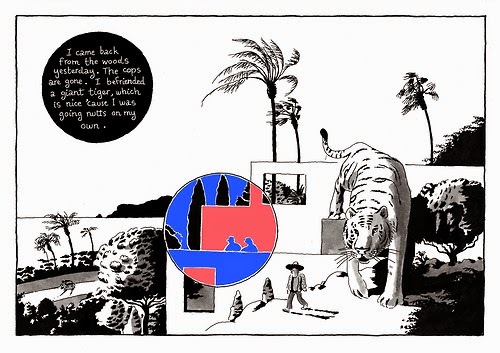 They'll have Cosse's new, limited edition comic, NWAI (which seems to be tailored to my aesthetic/printing weaknesses), a landscape format, risograph printed comic in a classic magic realist style (that's an excerpt from it below). Also to be found at the Breakdown Press table: Joe Kessler, Zoe Taylor, Lando, and JMKE. They'll be representing Space Face Books as well, with copies of all their latest books on sale, including Simon Hanselmann’s Life Zone and Jonny Negron’s Loose Joints. 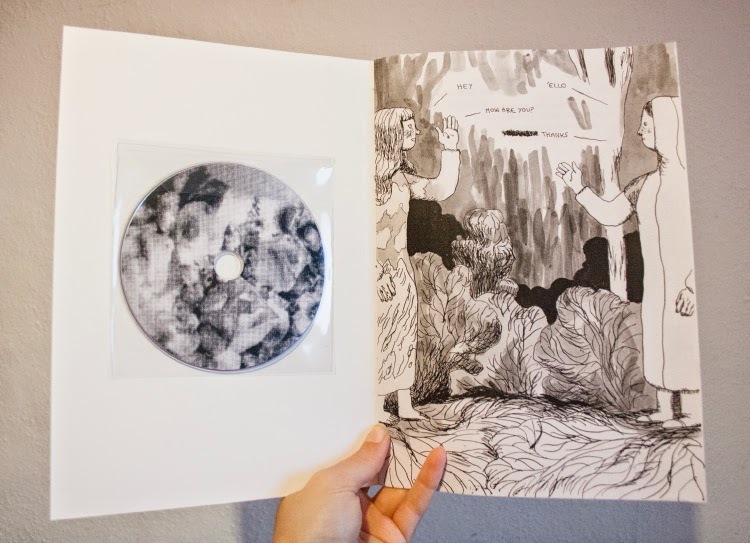 I'm very much hoping that there'll be copies of Connor Willumsen's Treasure Island 2 available, hopefully. Thereza Rowe makes the most beautiful things- she'll be signing books all day and debuting her brand new limited edition concertina book, The Avantgatz. You also get a fantastic free Penelope puppet kit when you buy a copy of her book, Hearts. Pleased to hear Robert Ball's got a new comic out, Dark Times- that's the cover for it below- terrific, huh? I'm newly evangelistical about Ball's work, so make sure you stop buy his table and buy the superb Winter's Knight, too. Supers, his pin-up book, is brilliant, also, and has more, um, superhero art in it- makes a lovely gift. I've begun to collect toys, now, too (more on that alarming story Friday), so I'm wanting to get my hand on one of these TMNT heads by Benjamin Wright- expect they'll go fast- essentially, you have to whizz around ELCAF buying things before they sell out- it may not sound pleasant BUT IT IS. I think and Wright and Issac Lenkiewicz are going to perhaps have a new comic out- I'll buy anything with those guys names on, and you should too. 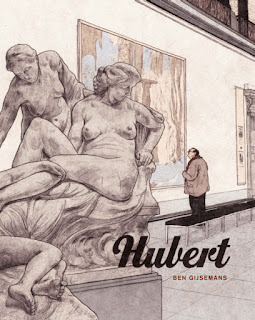 That's more or less the end of the round-up- there's certain to be a 100% of more wonderful books and things, but these are the ones that have caught my eye on social media. I've mentioned it before, but if you don't stop by the Drawn and Quarterly table to pick up Anouk Ricard's Benson's Cuckoos and have it signed and squiggled in by her, I'm gonna judge you. Hard. 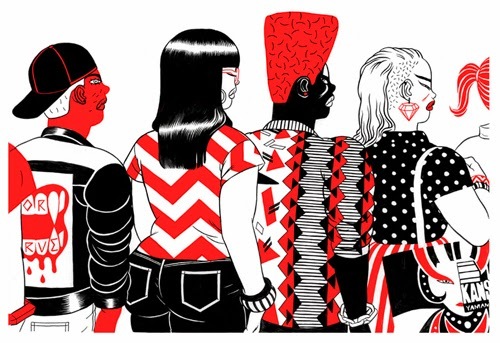 And if you needed telling, Nobrow have their usual tables of awesome, but I think are debuting another gorgeous new lepoerllo, Beyond the Surface, by Nicolas Andre and Moonhead and the Music machine by Andrew Rae. Did I mention Jesse Moynihan will be on hand to sign copies of Forming I and II? Be there, or be square (I'm going to refrain from adding a final rhyming line about Chris Ware here- we are all of us saved).